Congratulations Alton! You are 2/3 of the way to townwide Fiber to the Premise! 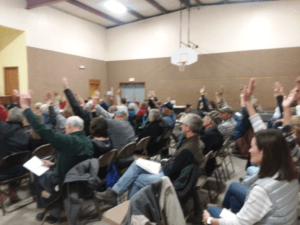 Voters almost unanimously support OTELCO FTTP build with an appropriation of $150,000. At your Annual Town Meeting on March 30th you almost unanimously approved the $150,000 appropriation for the project. OTELCO is investing an additional $290,000, but both hinge on a successful $260,000 grant application to the ConnectME Authority. 25% of the scoring hinges on community support with a goal of 85% of the homes being served. Currently, we’re at 39% because folks from 102 individual addresses have voiced support. To reach the goal of 85% we need support from a total of 221 homes in Alton. Right now we’re eligible for 10 of the 25 available points. It would be great to get them all! If you are interested in bringing LightWave Fiber to Alton, there are two ways you can help. Support the Warrant Article to appropriate the funds at the Alton town meeting on March 30th. If the article doesn’t pass, the project cannot move forward. You did that with flying colors! Support the ConnectME grant application. ConnectME applications are point based, with 25 points allocated if 85% of locations indicate support. If you check the pre-order box, Customer Care will contact you before construction commences to process the order with a $25 deposit. Those who pre-order will have their premise equipment installed while construction is underway so that service can be activated as soon as the network is live and tested. Those who choose not to pre-order will have to wait until construction is complete before placing an order for service. We will finalize and submit the grant application to the ConnectME Authority in May. We expect that the Authority will award the grants in June. Assuming our application is successful, construction will start within 30-days. We will extend our existing fiber network on Bennoch Road to 260 additional locations, covering approximately 21 road miles. This build will include the installation of multiple utility poles along Tannery Rd., as well as additional infrastructure along a portion of West Old Town Rd that is in Consolidated Communications’ (formerly FariPoint) territory. OTELCO, along with many other broadband leaders, believes that Fiber Internet is a future-proof broadband solution. Fiber-optic technology, which harnesses the power of lasers to transmit data at the speed of light, without weakening over long distances. On this map of Alton, OTELCO’s existing LightWave Fiber infrastructure is in pink, and the proposed build in is yellow. The proposed project cost is $700,000. Together, OTELCO and Alton have developed a three-part plan to finance the project. On March 30th, Alton voters will consider a $150,000 appropriation to support the project. If funds are approved, OTELCO will apply for a $260,000 grant from the ConnectME Authority. if the grant is awarded, OTELCO will invest the remaining funds necessary to complete the project.